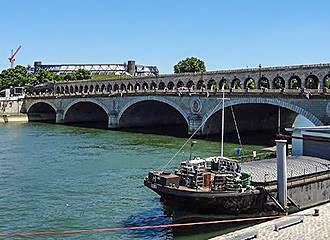 Linking the 12th and 13th Arrondissements of Paris, this bridge over the River Seine is a vital artery between the two banks, and although the bridge has been enlarged, the original was constructed back in the 1800s. 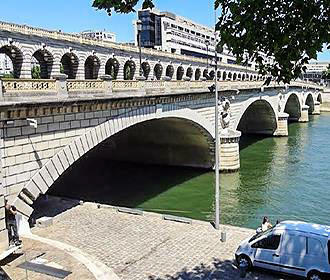 It was back in 1830 that it was decided a bridge was required across this stretch of the River Seine, and the first stone was laid by King Louis Philippe in 1831 and it opened on 29th January 1832. Yet this suspension bridge was actually outside the Paris city limits at the time of construction and therefore a tax was charged for people to be able to cross this bridge over the Rover Seine, but because of the nature of construction, the weight load going over the bridge was limited. By 1861 it was deemed necessary to replace the bridge with a stronger one and designed by the engineer Feine-Romany, a stone bridge was constructed between the years 1863 and 1864 with wreaths surrounding the windows on the tympana. They also decided to name this the Pont de Bercy, which was also within the city limits by this time, and this new bridge in Paris did not have any toll or tax after the reconstruction, but this stone bridge had to be widened in 1904 in order to take the Metro train viaduct. Over the years the amount of traffic in Paris has grown tremendously, especially with the development of certain areas, and it was deemed necessary to enlarge the Pont de Bercy in order to help sustain the weight of traffic in the city. So, on 20th January 1986, the Paris council made the decision to double the existing Pont de Bercy bridge by adding additional vehicle lanes and a pavement. A competition had been launched for the design, structure and engineering elements of the new Pont de Bercy bridge, and it turns out that the project chosen was to make the new bridge look identical to the original by using a quarry stone facing and by keeping the piers in line with the originals as well. 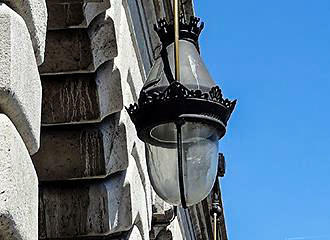 The features of windows with laurel wreaths surrounding them, which are located on the tympana in between the arches above the piers, were also a design feature, the same as the original bridge. Now, the old bridge was constructed of stone, whereas the new utilises reinforced concrete just dressed in stone, and the new part buts up to the old, so that there is no weight load transfer. But you would not think that the new Pont de Bercy was only opened in 1991, but the original parts of the bridge had some repair work on the facing in order to fully completed and update this bridge over the River Seine, which meant it wasn't officially complete until the January of 1992. So even though parts of it are very modern, this is still a lovely bridge in Paris to discover, especially with the numerous arches of the viaduct for the Metro trains, plus it looks picturesque when lit up of a night time. The Pont de Bercy bridge spans the River Seine from the Quai de Bercy in the 12th Arrondissement on the right bank and goes over to the Quai de la Gare on the left bank in the 13th Arrondissement of the city. And being in such a strategic position between two train stations and numerous different tourist attractions in Paris, there are several means of public transport within easy reach. 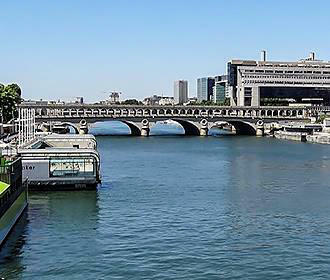 To start with you have the Quai de la Gare Metro station on the left bank of the River Seine that serves line 6 along with the Gare d’Austerlitz train station which is the nearest RER stop on this side. And on the right bank you have the Bercy Metro stop serving lines 6 and 14 along with the Gare de Lyon train station, which is also the nearest RER stop.